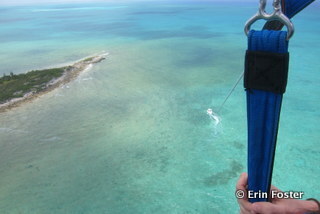 Guests looking for a bird’s eye view of paradise should check out the parasailing excursion at Disney’s Castaway Cay. Floating hundreds of feet in the air, you are master of all you survey. Well, at least it seems that way for several minutes. During the parasailing excursion at Castaway Cay, guests board a speedboat and travel several hundred yards away from land. 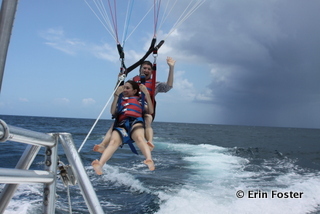 Then, in singles or pairs, guests stand at the back of the boat and are harnessed to a line-bound parachute that is slowly let out until you and the parachute are 600-1000 feet above the water. Enjoy panoramic views of your ship, Castaway Cay, and beyond. My daughter and I getting hooked on to the parachute. As you can see, we’re snuggled up pretty close. Each excursion takes approximately 10 people onto the boat. Your actual parasail event will last about 5-7 minutes. 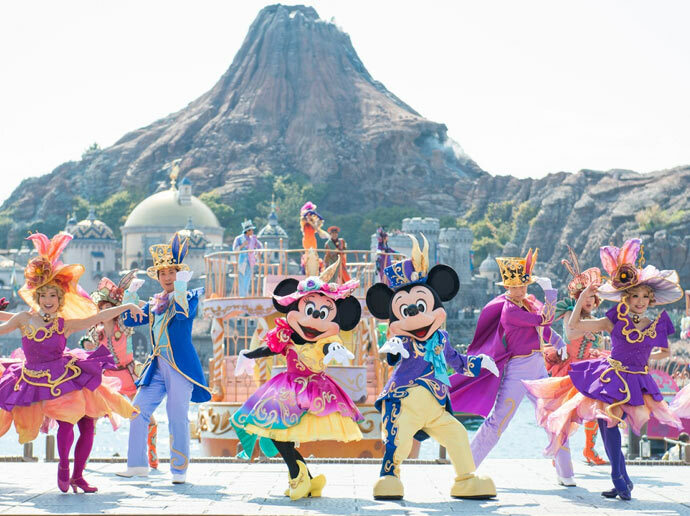 Depending on the number of other guests, the entire experience lasts 45 minutes to one hour. There are no “ride alongs;” every guest on the boat must pay and participate. The Castaway Cay parasailing excursions are open to guests ages 8 and up. The minimum weight is 90 pounds, and the maximum weight is 375 pounds. Guests under 90 pounds may be able to ride if they fly tandem with another guest. However, the combined tandem weight may not exceed 375 pounds. Determination of single or tandem rides is fully up to the discretion of the staff. Children under the age of 13 must be accompanied on the excursion by a paying adult age 18 or over. Guests ages 13-17 may go on the excursion unaccompanied, but must be escorted to the Marge’s Barges excursion meeting site by an adult age 18 or over. All guests must sign a safety waiver. Guests must leave shoes on the dock. Guests are strongly discouraged from wearing hats or glasses during their sail. There is storage area on the boat for your personal belongings. Wheelchairs and other wheeled mobility devices can not be accommodated. There is no photography service provided during the excursion. You are welcome to bring cameras onto the boat. You may bring a camera during your parasail. However, you assume all liability for the loss of anything you bring up with you. Understandably, anything dropped into the ocean can not be retrieved. 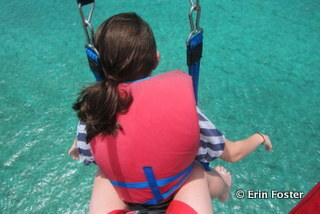 The Castaway Cay parasail excursion is currently priced at $79 per person for both children and adults. This is a popular activity. Reservations are strongly recommended. You can make reservations via the Planning Center section of the Disney Cruise Line website (disneycruiseline.com/plan). Or at the Excursion Desk on board your ship. Obviously this is a personal call. If you have a severe fear of heights, this is not the activity for you. Otherwise the experience is fairly gentle. It looks pretty hard-core from a distance, but once you’re in the sky the ride is peaceful. There are no bumpy or jarring movements as you might encounter on a roller coaster or other thrill ride. Other than the noise of the wind, there are no sounds; it can be quite meditative. 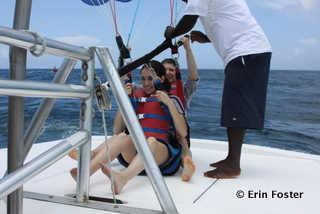 Your humble scribe finds parasailing to be MUCH less scary than the Tower of Terror. We’re higher than the Dream! There may be some spray while you’re in the boat, but you will only get wet while you’re actually parasailing if you decide that you want to. You start your experience on the dry back deck of the boat. 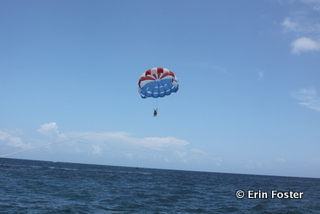 The captain may ask you if you want a “dip” or a “dunk” at the end of your parasail. Dips involve touching your toes into the ocean at the very end of your ride. Dunks involve entering the ocean up to your torso. If you don’t ask for these extras, you will remain dry during your flight. How will I know if I’m going up solo or with someone? This is solely up to the discretion of the captain. Expect that if you’re a smaller person, such as a child on up to an average size woman, you’ll be riding tandem. Larger men will likely have solo parasails. Is there a price difference for solo or tandem rides? No, everyone pays the same price. Our view while in the sky. That tiny white dot in the middle is our boat. Is there a chance I’ll have to fly with a stranger? Yes, this is a possibility. Again, if you’re an average size woman or child, you will likely have to sail with another guest, even if they’re not a member of your immediate party. The experience of flying tandem is somewhat intimate. 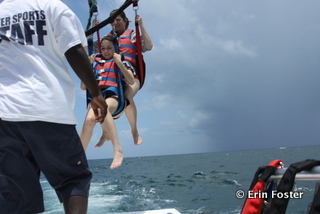 You will likely touch the legs and arms of your parasail companion several times. If interacting with a stranger in this way makes you uncomfortable, you may want to think twice about this excursion. I see weight mentioned a lot. Are they going to weigh me? They didn’t weigh us, and we didn’t see a scale anywhere on site. The parasail boat staff appear to just “wing it” when deciding whether individuals or groups are of an appropriate weight for the prevailing conditions. Will I fly over the ship? No. The parasail operators are prohibited from taking guests over the ship or the Cay. You will, however, have breathtaking views of both. Our bird’s eye view of the Dream. Can one of the excursion operators use my camera to take photos of me during my sail? No, the operators are busy during the excursion driving the boat, making sure your line is safe, and readying other guests for their flight. We asked another guest to help us. They took photos of us with our camera and we took photos of them with their camera. Most guests will be happy to arrange something similar. Can I really take my camera up on the sail? Yes. Our operators said that while they discourage guests from using cameras while sailing, this is not prohibited. The potential problem with taking a camera up is the very real possibility that you’ll drop it into the ocean. And once it’s gone, it’s gone. We took a pocket sized digital camera with us on our sail and were able to get some incredible photos of the ship. A friend of ours took a video camera during her parasail excursion with great results. How did you keep your camera safe? Tandem riders will be touching their companions during flight. Don’t parasail with a full memory card. Before taking any camera up for a sail, start with a fresh memory card, or download all your other vacation photos to a tablet or laptop. You won’t want to lose your vacation memories along with your electronics. Don’t take your best or only camera on your sail. Consider bringing a lanyard, neck strap, carabiner, or other protective mechanism to secure the camera to your person or to your floatation device. If you want ensure your camera stays dry, don’t ask for a dip or a dunk. But obviously, don’t take anything up into the sky that would be mission critical if you lost it. I can’t see without my glasses. Can I wear them during the excursion? This is another situation where it’s your call, but if something falls during the flight, it’s really, truly lost. The tour operator will allow you to wear glasses during your flight, but they assume no liability for loss. If you do choose to wear glasses, be sure to secure them with a protective strap. There are a number of brands of inexpensive, adjustable eyewear straps made for sporting activities. You may only want to attempt this if you have a back-up pair of glasses with you. Is weather a factor in this activity? Yes. This excursion may be cancelled in poor weather conditions. If the tour is cancelled your fees will be refunded. Coming back in for a landing on the boat. I’m deciding whether to parasail on Castaway Cay during my cruise or at the Contemporary Resort during my stay at Walt Disney World. Are there any differences? Pricing. The Castaway Cay flights are a uniform $79 per person, for both single and tandem riders. WDW flights cost more. At WDW, single regular flights are $95, single deluxe (longer/higher) flights are $130. At WDW, tandem regular flights are $170, tandem deluxe flights are $195. Privacy. Castaway Cay parasailing excursions typically include several parties, with approximately 10 guests on board the boat. At WDW, your party has its own boat. Ride Alongs. Ride Alongs are not allowed at Castaway Cay. Assuming there is room on the boat, ride alongs are allowed at WDW. Age limit. At WDW, the minimum age is six. At Castaway Cay, guests must be eight years old to participate. Sail Duration. Standard flights at WDW last 8-10 minutes, with the option of requesting a 10-12 minute deluxe flight. Flights at Castaway Cay last 5-7 minutes, at the discretion of the tour operator. Total duration of the experience. At Castaway Cay, you must remain on the boat until all parties are done with their flights, typically up to an hour. At WDW, when your party’s flights are done, the experience is done. You may be finished in 15 minutes if it’s just you. Height. Standard flights at WDW are approximately 450’ high. Deluxe flights at WDW are approximately 600’ high. Castaway Cay flights are 600-1000’ high, at the discretion of the operator. Getting wet. Castaway Cay operators may offer you the option to “dip” or “dunk” at the end of your flight. You will not be able to enter the water at WDW. The View. At WDW, you’re looking at the Magic Kingdom and surroundings. 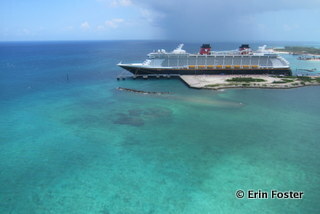 At Castaway Cay, you’re looking at your ship and the island. Photography situation. At Castway Cay, there is no professional on-boat photography option, but you are allowed to take your camera on your flight. At WDW, professional from-the-boat photo and video packages are available for purchase, but you are not allowed to take your camera into the air. It really depends on your situation. If you have a seven-year-old who is dying to try this, then WDW is your only option. You’re also better off at WDW you want to control whether you fly tandem or solo, if you have a hankering to see the Magic Kingdom from above, or if you have personal space issues. You’re better off parasailing at Castaway Cay if you’re price sensitive or if you’re dying to try some aerial photography. In a heartbeat! Sign me up! This is great info! I had signed up on my last cruise but it was cancelled due to wind speeds. Thanks for sharing! Wow! I love the pics from up above – incredible! Erin thank you yet again for your amazing articles. You helped so much in our first trip to WDW last year, and now you must have sensed that we were going on our first Disney Cruise in December. I would love to see more articles from you regarding Disney’s cruises. We’re considering doing this on our cruise in late September. 5-7 minutes seems like such a short time & $80. I know this is subjective, but does it seem like you go up and then come right back down, or do you think you get your “moneys worth”? Thanks! As you point out, the perception of time is subjective. 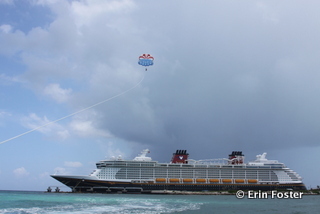 I’ve been parasailing at both WDW and Castaway Cay and neither time did I feel rushed. During both the “up” and “down” segments of the trip, you’re seeing plenty of scenery, enjoying the air, and feeling the sensation of flying, so I don’t discount that part of the experience. Maybe one or two minutes more would be good, but I don’t think I’d want the flight to be much longer than it is. Your mileage may vary. Thanks for the response, Erin… just what I needed to know! I think we’re going to go for it.